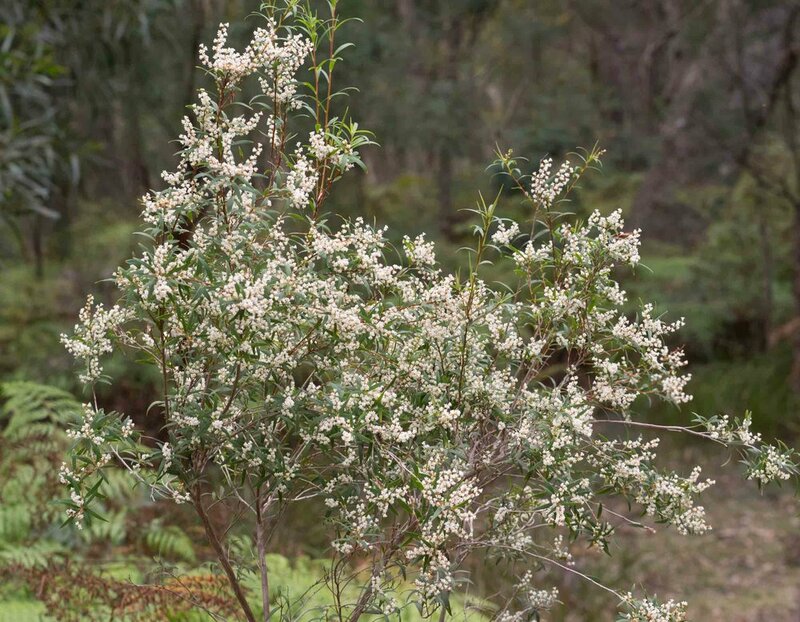 While both of our home Lance-beard Heath species - Leucopogon ericoides and Leucopogon affinis - have been flowering for a couple of weeks, they are now putting on quite a show. These bushes have also attracted the attention of several insects that feed on the nectar and pollen of these tiny flowers. These include the introduced Honeybee (Apis mellifera), but also a couple of native insects that we haven't previously sighted at home. On this warm, sunny day there were hordes of Honeybees on the Beard-heath, greedily thrusting their probosces into the flowers. You may notice pollen on the hindleg of this bee. Honeybees have a specialised basket (called a corbicula) built into their hindlegs to store pollen. But it's not just a container - it's a press, which packs the grains of pollen into little balls. This website gives a nice explanation of how they operate this complex bit of kit. Much less obvious and present in far smaller numbers was a native bee. We have previously seen four species of native bees on the block, and even as I took the first photographs I could tell that this was not one of those - much smaller. After a bit of detective work, I was able to identify it as a Reed Bee (Exoneura sp.). The difference in size between the Reed Bee and the Honeybee is obvious when you use the Leucopogon flower as a measuring stick. Exoneura is only about 6mm long compared to the 14+mm of the Apis mellifera bruiser. 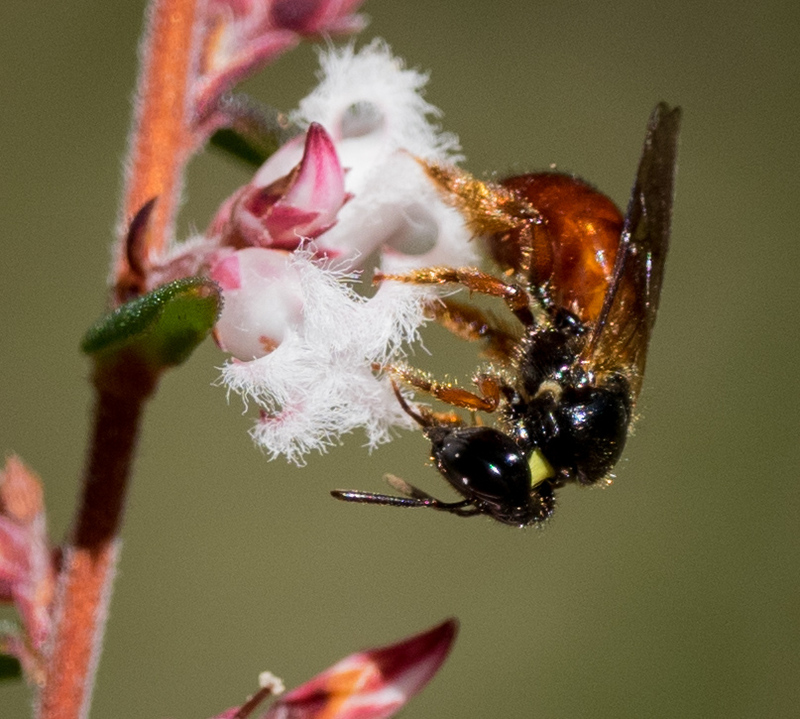 This Exoneura bee is feeding on the flowers of Leucopogon ericoides - tinged with pink tips and bases. Exoneura doesn't have a specialised pollen basket - just a dense mass of long, golden hairs on the hindlegs. Reed Bees get their name from their habit of digging out the pith of a plant stem to form a burrow for their developing larvae. While several Exoneura females may share a nest and guard duties, clearly differentiated castes of workers and queen bee do not exist in this species. Indeed just 11 of the total 1700 native Australian bee species - in only 2 genera - show this type of highly organised social behaviour. Finally, some shots of two other insect species we saw taking advantage of the abundance of food on the Leucopogon bushes on this fine Spring day. And at the same time doing a fine job of pollination! 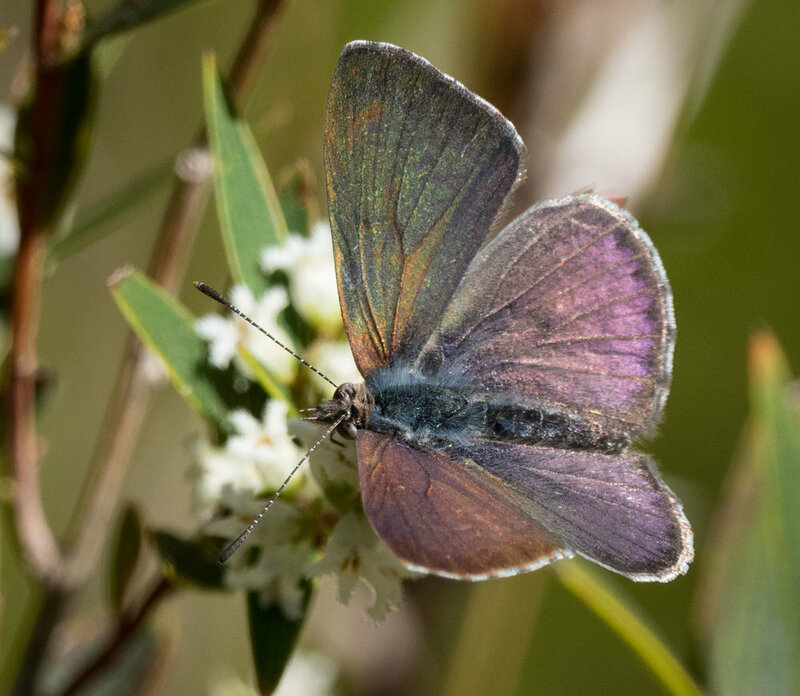 The Common Dusky Blue butterfly (Candalides hyacinthinus) making its first appearance for the year. Probably newly-eclosed. 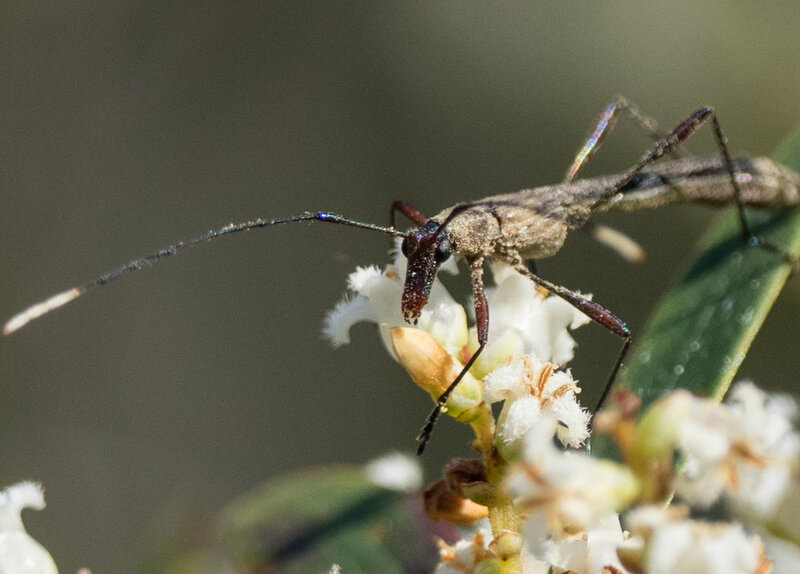 A longhorn beetle, probably Rhinophthalmus sp., wandering around the Leucopogon affinis flowers in search of pollen and nectar. A new one for the books! This body of this guy was covered in pollen!